The Lynx faux fur throw makes a statement all on its own; as it sets the mood of any room to ‘luxury’. Even the most stoic won’t be able to resist burrowing their fingers into the thick white fur of this blanket or pillow. Sweet Dreams Are Made of These animal print blanket. We just can’t convey with words – or even photos – how astonishingly soft these napping essentials are. 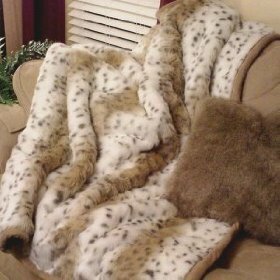 Tan and white stripes with grey spots identify this incredibly soft faux fur as a replication of the extraordinary Lynx. The throw is lined with camel-colored short-pile faux fur and is trimmed with the same color faux suede. 45 inch by an extra long 65 inch.